One of my favourite apps — one of the most important apps I own — just had a significant update for macOS. Scrivener is such a rich, and well thought out writing tool that I have held back on covering it until I could provide adequate detail. Now that version 3 has been released, I will have a chance to review it properly. In the meantime, call this a prelude. If you are already a user now is good time to upgrade. 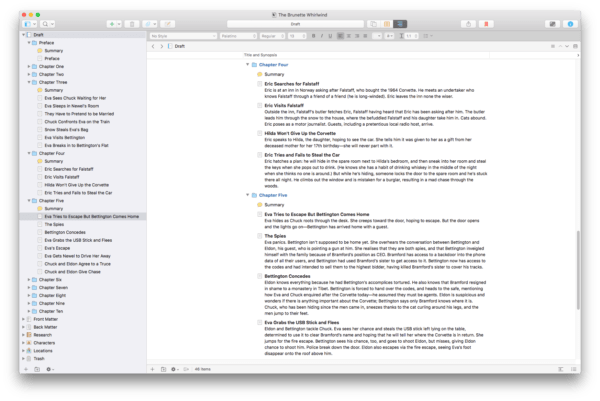 If you are looking for an alternative to Word for writing a thesis — for any kind of long form writing — now is the perfect time to check out Scrivener. Existing users can upgrade for $25. New users will only pay $45, and there is an educational discount license for students and academics at $38. Trust me, this is a steal. Microsoft Office will set you back $120, if you have to purchase it yourself. Or, put the one-off purchase of Scrivener against a subscription the most directly comparable app, Ulysses. The value is immediately obvious. 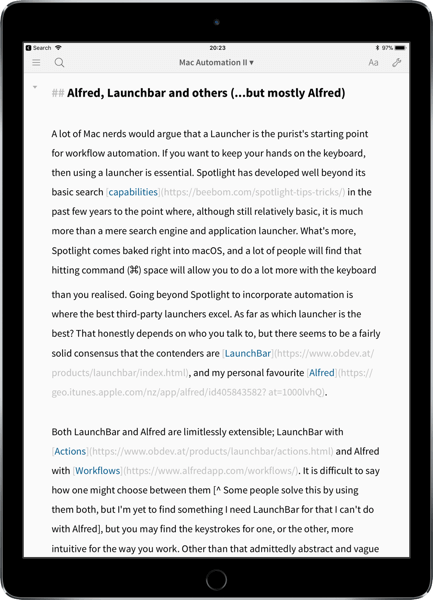 The comparison with Ulysses is not unwarranted, the two apps get compared a lot for their ability to organising text. However, Scrivener is a much more comprehensive app for writers requiring research tools, and working on much large projects. Scrivener can do things that Ulysses is not made for. Writing a dissertation, or a thesis with Ulysses is more than possible. It may even suit some disciplines. In my experience, Scrivener is one of the more ideal tools for the job. Looking for an Alternative to Word for Writing a thesis? With outlining, context mapping, indexing, and more Scrivener can save you from the anxiety inducing mess of multiple, bloated Microsoft Word files. Why anyone would want to write anything legitimately long-form; a thesis, a dissertation, or a book of any kind in Microsoft Word is beyond me. Although, my working theory is that most writers stuck in the word processing paradigm simply don’t know any better. 1 It might seem extreme, but I’m not kidding when I say that writing with Scrivener saved me from all but giving up on long form writing. If you have anything like the chaotic, organisational ticks that I carry around, Scrivener can provide unique respite. Not only is it an alternative to Word for writing a thesis, it is a better experience in every conceivable way. I know there was a time when Scrivener turned away prospective users with it’s interface. I was one of those users once. The skeuomorphism of the early versions went a little too far for my liking. A virtual cork board with cork texture. It didn’t work for me. Say what you like about that kind of superficial reaction, but aesthetics matter in interface design. If you don’t like looking at something, you don’t want to work in it. If you have followed the history of this app, you might know that Keith Blount taught himself to code specifically to make Scrivener. The alternatives available for long-form writing were that discouraging. I would argue, if he hadn’t done that we would still be in a similar place. That the original version wasn’t all that easy on the eye is not surprising, the functionality of the app is a remarkable achievement. Version Two gave users more control over those elements. In turn, fussy users like myself were better able to understand the powerful utility of a genuinely purpose built writing tool. Fast forward to this version, Scrivener 3, and the interface is thoroughly modernised. Frankly, it looks amazing. I have every intention of covering the release in more detail as I start to uncover its finer points. In the meantime, if you are looking to ditch MS Word — or even Pages — and the more straight up text editors are too sparse for you. Scrivener is worth your attention. Especially if you are writing any kind of long-form work, but even the humble research essay can benefit immensely from a bit of fine control. I have tried to stay away from Black Friday and Cyber Monday deals as much as possible. However, I want to mention the discount on Brett Terpstra’s wonderful Marked 2 app. Given the only other deal I mentioned was DEVONthink — for its relevance to the overarching concerns of this site — that should give you some idea of the esteem I hold Marked in. I'm confident Marked will be relevant to a number of readers of this site. It is one of those apps that you don’t necessarily know you need until you have it, then you wonder how you ever worked without it. 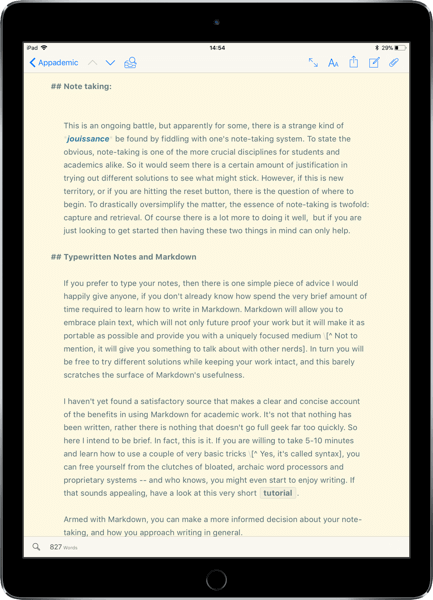 If you don’t know about Marked, it is an essential tool for writers working with Markdown, but it is so much more than that. Marked comes loaded with a stack of advanced tools for formatting, proofing, checking, and analysing your work. Highlighting keywords, checking for repetition, and analysing readability; Marked will give you a Fog Index and Flesch-Kincaid scores. It is essentially a powerful Swiss army knife for text, I honestly don’t know what I used to do without it. That’s not true, actually, I either didn’t have access to tools for improving my writing, or I had to go here, there and everywhere to use a fragmented and forgettable system that gave me a headache. For today and tomorrow only, you can get 40% off the direct version of Marked 2. That’s the non-sandboxed version that allows more full-fledged running of your own custom scripts and processors, but is otherwise the same as the Mac App Store version. Use the coupon MARKEDMONDAY at checkout and get Marked for $8.39, 40% off the usual price of $13.99. The easiest way to grab the deal is to follow the link through Brettterpstra.com. That way the discount will be applied auto-magically. Otherwise, you can head there directly and apply the coupon yourself. You can also get Marked as part of the Setapp suite. To the uninitiated — you can include me there — fonts are just fonts, right? Some look nicer than others, some have been mercilessly ridiculed. However, if you are obsessive designers making one of the best minimalist writing experiences you will find anywhere, the story is much more complex. iA Writer has made me reconsider the relevance of font design to the writing process. Here there are adding more texture with a painfully deliberate font choice. I see their point, it looks amazing. linked to the recent update of iA Writer a couple of weeks ago, it seems the developers have clicked into a new gear. The app is looking better all the time. This year, again, we set out exploring our own writing font. We started from scratch, moved from proportional to monospace to three spaces (50% for i and j) and ended up with duospace for MWmw. Progressively, we came to realize that the right question is how to make a proportional font look like a monospace, but how many exceptions you allow until you lose the benefits of a sturdy monospace. With Latin characters you need to free the m’s from their obsolete mechanical straight jacket. What about the w’s then? And if you give room to lower case letters, what about their parents? The M and the w look alright in mono, no? They almost look better, even… Well, not next to a free m. In Cyrillic, there are a couple of characters more that need breathing room. If you give 150% to the letters w, W, m, and M, you get a text image that has almost all benefits of a monospace font, but the text flows nicely. And born was the duospace concept. If you are looking for a plain text writing app for academic writing — or for any writing for that matter. You could do a lot worse than to try out iA Writer. One of the first Markdown based Text Editors I ever used, it remains one of the writing apps I am most likely to recommend on any platform. With the recent change to a subscription model for Ulysses, a lot of writers are looking for an Alternative on iOS. 1 With this latest update, iA Writer is an ever more obvious candidate for that job. 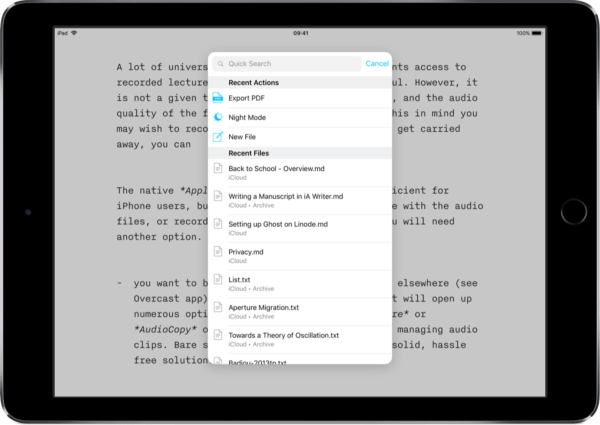 In my post about academic writing on the iPad, I mentioned iA Writer is a pleasure to work with on iOS. That was always true, where the actual writing is concerned. Prior to this release, if you were used to working in an app like Ulysses, you might have found the organisational aspects of iA Writer less sophisticated. This update has addressed that in a big way. Both via the extension of utility to the keyboard, and through integration with the Files app in iOS 11. Retaining its singular focus on the writing experience, iA Writer now includes excellent search capabilities, and customisable commands. All from the keyboard. in practice writing resists a strictly linear process. A single note doesn’t transform smoothly into a draft, and from draft to editing is more of a Tango than a March. The common process is blurry, dynamic, and in many ways circular. I come across a lot of writers who haven’t gotten past their Microsoft Word dependency. Often it is because they don’t realise what an alternative writing App like iA Writer is capable of. Turning in your papers as Word documents is not a problem. With iA Writer, or Ulysses you focus on the writing first, then export the finished product in the format required. Nothing has changed with this update for the end product, but exporting is another feature made accessible through the keyboard. On iOS, you might require some workarounds for referencing, but if you are looking to ditch the word processor. There is less standing in your way than you may realise. The direction that Information Architects are taking is encouraging. They have opened the app up to a massive new user base with an Android version. That move has proved fruitful in encouraging the development of a web collaboration tool. That is a move that I will keep a keen eye on. Collaboration is another area that keeps writers attached to Microsoft Word, or more often Google Docs these days. The options for co-authored writing in plain text are few and far between, and I’m yet to find one with a remotely satisfying user experience. If the developers can bring anything like the polish of this latest update to iA Writer to web based collaboration, it could work out very well. The intention is for the web service to provide ongoing revenue, which I suspect will go down with users better than the subscription only option being adopted elsewhere. Time will tell. For anyone still grappling with the subscription issue, the feature set of iA Writer makes it a compelling alternative to Ulysses. I have a subscription to Ulysses as part of Setapp, so I haven’t had to contemplate that dilemma too closely. If you have, you may want a comparable Markdown text editor for macOS, iOS, or both. To get a general feel for the app, you can start with a free trial of the Mac App. One of the features that has me using Ulysses more these days, is the ability to post directly to WordPress. You can do the same thing with iA Writer. iA Writer 5 is a free upgrade for owners of the app, and for new users the iOS version is still sold at a ridiculously low price. The macOS version of the update is yet to be released, more on that when it arrives. Jason Snell's ode to Editorial. Having just given my own vote to Editorial as my preffered text editor for iOS, I'm pleased to see it still getting the recognition it deserves. This year has seen significant changes to the iPad. Changes have either explicitly relevant to education users, or favourable by virtue of the way developments to both hardware and software suit the various use cases for students, teachers, and researchers alike. With the upcoming release of iOS 11 about to address a number of long-standing usability issues, the iPad is becoming a serious choice for getting your college work done. I find the inane arguments that do the rounds pitting the iPad against the Mac, or PC, to be mostly pointless. But, to the question of whether or not you can now use the iPad as your primary device for your college or university work, the answer is a resounding of course you can. In fact, in a lot of ways the interaction model and user experience of working on an iPad is not only a good choice for some people, but the best choice. For one, although there has been a quiet evolution of multitasking on iOS, the iPad remains a uniquely focused device for singular tasks. The advantage to such a focused user experience is an especially obvious when it comes to writing. Given that so much of the academic work is writing, embracing a device that, in its design, has a tendency to encourage less distraction can only help. I would go further, however, to say that the iPad is uniquely enjoyable as a writing device, and continues to improve in this regard all the time. It has seemed obvious for some time that the tablet is an ideal form factor for other academic tasks – namely note-taking and presentation – but if you haven’t yet used it for serious writing, there is no time like the present. With that in mind, I thought I could offer a leg up on the best apps to use for writing on the iPad. These days I prefer not to work in a standard word processor, but that doesn’t mean I can avoid them altogether. Access to all the usual suspects for word processing is just as good on the iPad, if not better in some cases. Microsoft Word, to my mind, has always been a bloated mess that I can’t get far enough away from. Fortunately, if you absolutely have no choice but to use it, the necessity of paring it down for iOS has resulted in an infinitely more useable piece of software. Although, if you do feel you have to stick with a standard word processor, then you are probably better of sticking with Apple’s own Pages. Not only is Pages compatible with Word, it has all the advantages that come with being a native app. Pages has also had some intriguing updates lately, adding LaTex support for mathematical equations for example. Beyond Word and Pages, there is always Google Docs, which has admittedly improved on iOS since the inclusion of multitasking support. Google has also sown up deals with universities everywhere, which often means unlimited file storage is available. While Apple has started adding collaboration support to their iWork apps, Google Docs remains the standard bearer for simple collaboration. If you are looking for something different in a word processor, Mellel is developed with features specifically designed for academic work. Most of these things exist in other word processors, but Mellel has made them design features. This means the document outline, footnotes, bibliography and so on, are part of the workflow rather than an afterthought. As I cover below, I do my own long form writing in Scrivener these days, but Mellel is a solid choice for anybody looking to break away from the big names while keeping with a classic word processor. A large amount of the writing I do is in Markdown these days. I briefly outlined a case for why I think that is a good idea for note-taking here, but the portability and future-proofing are just as relevant to all forms of writing. If you're not already writing in Markdown, this is not the kind of article that will persuade you to start. If you are already a Markdown convert, you are well served by the text editors available on iOS. As for my preferred app, I have a couple. I have already praised Ulysses a couple of times here. 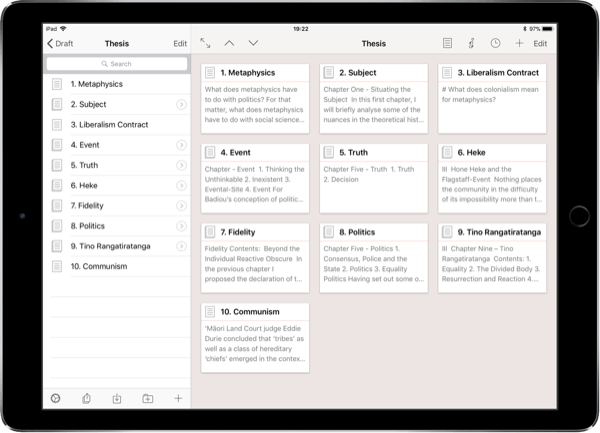 It is one of the best writing apps available period, so ideal for writing essays and research papers. Ulysses is an excellent combination of a lean and distraction free text editor with a more integrated writing tool. It includes subtle features to bridge the gap between rich text and plain text writing. Along with built-in tutorials, this also makes it ideal for coaching new users into using Markdown. The syncing between Mac and iPad is seamless. 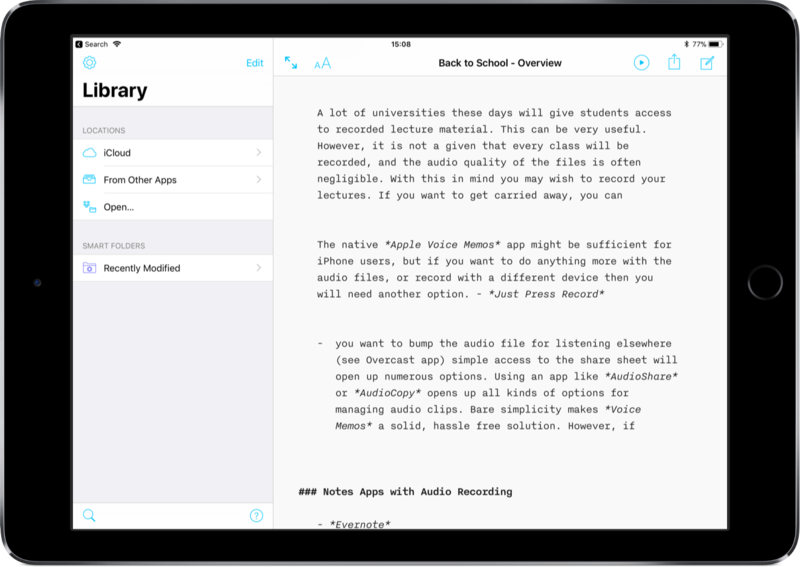 The universal app on iOS also means that should you wish to indulge in note-taking, or even more detailed writing on your iPhone, your text will all end up in the same place. Ulysses has also embraced iOS automation. Integration with Workflow has essentially made the app extensible, allowing users to adapt their own automations for getting text in and out of the app. I am mot the most proficient Workflow creator, but I have managed to hack together some simple workflows that allow me to gather and annotate links for posting to this site. For example, throughout the week I gather links for the regular Week Links post. I store them in Drafts as I collect them, but that is idiosyncratic, you can go straight to Ulysses if you would prefer. You can download a copy of the workflow here, if you want to see how it works. At the end of the week, I process the document from Drafts to Ulysses using this Workflow . Granted, these are workflows specifically for web writing, but there is no reason you cannot adapt them for academic needs. Workflow can do practically anything, provided your imagination and patience can drive it to do so. Formatting citations, for example. This is something I intend to come back to in detail, very soon. If you write for the web, Ulysses has publishing integration for WordPress and Medium. This feature alone has been enough to pique my attention, and start tempting me away from Editorial, a long time favourite on iOS. These are all great things to have in an iOS tech editor, but the real power of Ulysses is in its capacity to organise text on the fly. Breaking down sections, merging them and moving them around is factored into the DNA of the app. What you end up with is an app that has all the elegance of a minimal text editor with the extremely clever ability to manage serious writing projects. As an alternative to Ulysses, if you want something even more minimalist, an app I have always liked is iA Writer . An example of opinionated design, iA Writer provides a wonderfully spartan, and focused writing environment. The app is the product of two things. First, an obsessive attention to detail in responsive typography. And second, the design principle that form follow content. The result is an app that remains deceptively powerful, while getting out of the way of the writing process. Right down to the inclusion of content blocks for managing embedded media. It was iA Writer on the Mac that first converted me to Markdown. The iOS app is not only faithful to the look and feel of the desktop app, but a pleasure to use on the iPad. As more and more apps smuggle in price rises as they push into the world of subscriptions, the contrast in value is stark with an app like iA Writer that you pay for once. Despite my enthusiasm for these other apps, as I mentioned above, most of the writing I do on the iPad is in Editorial. The main reason is that Editorial includes powerful workflow automation through its Python engine. Not only can I automate a number of tasks, but I can manage citations from a plain text bibliography file. This is something that Workflow could handle with Ulysses, but ultimately Editorial's Python capabilities are even more powerful. The details of how I mange that are something for a later post, but if you have an inkling of what I am referring to, you can do much worse than pick up a copy of Editorial. Despite my enthusiasm for these other apps, as I mentioned above, most of the writing I do on the iPad is in Editorial. The main reason is that Editorial includes powerful workflow automation through its Python engine. Not only can I automate a number of tasks, but I can manage citations from a plain text bibliography file. This is something that Workflow could handle with Ulysses, but ultimately Editorial's Python capabilities are even more powerful. The details of how I mange that are something for a later post, but if you have an inkling of what I am referring to, you can do much worse than pick up a copy of Editorial. If anything, managing citations is major halting point for academic writing on the iPad — unless you do it manually, like an animal. It is easy enough to hack your way around it for shorter works, but the more in depth the referencing required, the more tricky it becomes. Most, if not all of the major referencing management conceive of the iPad as a companion device. At best this means apps are designed for reading and annotation, and not for referencing per se. I currently use Papers, which is fine app on the Mac, but is bereft of options on iOS. Luckily, the one thing it can do is export a citekey, and Editorial can do the rest. Finally, this brings me to Scrivener. If you are working on any kind of long form writing, there is really nothing like it. I mentioned the way that Ulysses can cleverly organise text above. While that is true, it does meet with some limits were complex projects are concerned. I put this down to a consequence of maintaining some of the strengths of that app, adding certain features would interrupt its design. Scrivener on the other hand, is a kind of self-contained writing studio. It has unparalleled features for organising long-form writing projects, including the gathering of research materials and a plethora of tools for mapping, contextualising, and annotating text. 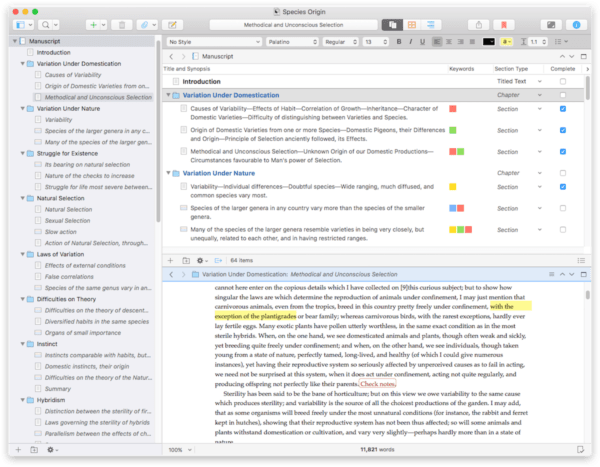 Originally developed for novelists, Scrivener has also steadily gained an academic user base of both students and researchers. As far as I can tell, the only people not using it for manuscript work either haven’t heard of it, or haven’t given it sufficient time to grasp its incredible usefulness. If you are working on a dissertation or thesis, or a book of any kind, then you will be hard pressed to find a better tool. Although designed for longer work, that doesn’t preclude its usefulness for other kinds of writing. As you can probably tell, I have a penchant for separating writing tasks in specific tools, but I wouldn't advocate indulging in that kind of madness if you can help it. Scrivener excels at any kind of text that requires organisation but it is also on the surface of it a text editor. You can use it to write what you like. As for using it on iOS. While it started life as desktop only software, the iPad version has near feature parity now. In fact, it was selected among the App Store best of 2016. Again, this is something I have in mind to cover in significant detail here, time willing.